Jean NDAMAGE is a Rwandan National and a holder of Master of Science in Forest Resources and Ecological Restoration from Yeungnam University (South Korea) after completing his research on “Impact of Human Activities on Urban Wetland and their Sustainable Management: A case study of Nyabugogo Wetland in Kigali City”. He is currently ARCOS Strategic Conservation and Development Advisor. Jean has experience in environment conservation, and Environment and Biodiversity Conservation is his passion and has been his dream career path. 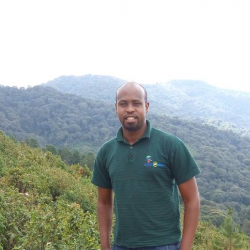 He worked as Environmental Facilitator at Rwanda Environment Management Authority (REMA) and involved in different consultancy research in environment protection. As Strategic Conservation and Development Advisor, he provides strategic support to different ARCOS programmes. Jean likes Football and sightseeing.